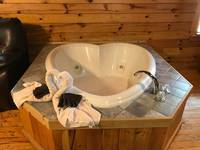 Located in Pigeon Forge, Tennessee, just outside the Great Smoky Mountains and Gatlinburg, this Honeymoon Cabin, one-bedroom cabin is the perfect log cabin for honeymooners or those sweethearts looking for the ideal romantic cabin. As you enter this cozy retreat your eyes immediately focus on the oversized Heart-Shaped Jacuzzi. This log cabin has a vaulted ceiling, king-sized bed and living area with stone hearth accented by a gas burning fireplace. The fully equipped kitchen is ready for cooking up romantic meals with ease or you could throw a steak on the outdoor BBQ grill. Snuggle up on the power reclining love seat,enjoying the gas fireplace and a good movie on the big screen TV, or enjoy some friendly competition around the pool table. Just outside your double French doors awaits a bubbling hot tub just for the two of you. I love Maples Ridge. Keep up the amazing work-hoping to see you again soon. I highly recommend them to everyone! Expect a beautiful view and clean cabin. Maples Ridge cabins was very quick at responding if you have a question! Definitely will recommend one of Baylee’s cabins to everyone. My son and his new wife stayed there for their honeymoon. They were in love with the cabin. It was super clean and too cute!! They loved the view and the feeling of seclusion but yet were very close to downtown Pigeon Forge. They will be back and my husband and I will plan a trip to one of Baylee’s cabins. Cute and cozy. Convenient to many activities. Thank you for providing such a perfect space for us! We had everything we needed! Super cute and super cozy cabin! We've stayed with Maples ridge a handful of times and there is a reason we always return. Friendly staff, great cabins, and great prices! Wouldn't even consider staying anywhere else, when visiting the area! Thank you for sharing your beautiful cabin with us! Can't wait until next time! The Cabin was Beautiful and very relaxing!!! When we come back we will be staying here!!! Thank you Baylee! Our stay was very relaxing!!! We had a wonderful stay at the Mountain Romance cabin. We had plenty of privacy, and it was a great location - not far from that main strip in Pigeon Forge. We hope to come back again and stay. Loved the clean, romantic cabin setting, too. Our stay was great because of the wonderful staff; they even called to check on us to make sure everything was ok at the cabin. We highly recommend Maples Ridge Cabins if you are looking for a nice place to vacation and super nice folks to rent from. Everything from the initial reservation months ago to checking out was wonderful! The girls at the office were perfect! We had a great time at the cabin. It was only minutes from the parkway and still a little out for quietness. The cabin was very clean and beds were comfortable. No complaints here! Will stay again in the future. Cabin was exactly as described online. Honeymoon cabin. Was a dream come true. Always wanted to stay in a log cabin in the mountains. Hot tub was an extra. Ate all our meals out on the balcony. Wonderful place! Perfect and peaceful for a relaxing getaway with my husband! BEST STAY EVER!! 1805 Wears Valley Rd, Pigeon Forge, TN, 37862, United States Our stay here was amazing. The cabin was very clean and very accommodating for a just married couple. Very quiet. We will definitely stay again sometime. If I had to complain about anything it would be the bed was a little firm, but I think that is to be said about any place you stay other than your own most times. The cabin was spacious. The setting was beautiful! We enjoyed the hot tub, pool table, a. The kitchen was well-equipped with quality pots, pans, and utensils. The bed is very comfortable. Great vacation!